I am still on a Woodland Hoodlet kick. The version for 12 inch fashion dolls is still in progress, but I decided to cast on a new one that will fit 10-12" dolls (like Tonner Patsy, and my Bambicrony Lottie) and 16" fashion dolls (like Tonner's Sydney). With this latest version I decided to take some pictures of the beginning. I find it very interesting how the fabric of knitting is impacted by the pattern/stitches. Cables especially have a huge impact. They provide a lot of texture and visual interest, but they also affect the size. When you're talking about huge cables, such as the twelve stitch ones in the Woodland Hoodlet pattern, you really see the impact. The first picture is with the setup rows only completed. It's three rows of basic stockinette, then two rows introducing the knit and purl pattern that sets up the cables. I laid the fabric down without stretching, and we have seven inches in length (or in the case of this pattern, "height", since we are knitting the front section back and forth.) If I were to knit this without adding cables, this would be way too big for my target doll, and sloppy on top of it. Size 2 US needles with Loops & Thread Woolike yarn held single. There are only knit and purl stitches so far. Next we have the project with the first four row repeat completed. The pattern uses short rows, so we are just beginning to start the shaping so that the neckline/top will be narrower across than the hemline/bottom. We have also introduced the cables and bobbles. We have introduced two sets of twelve stitch cables, plus a six stitch cable at the beginning of the four row repeat, and a four stitch cable at the end of the four row repeat. Otherwise all stitches are basic knit and purl. 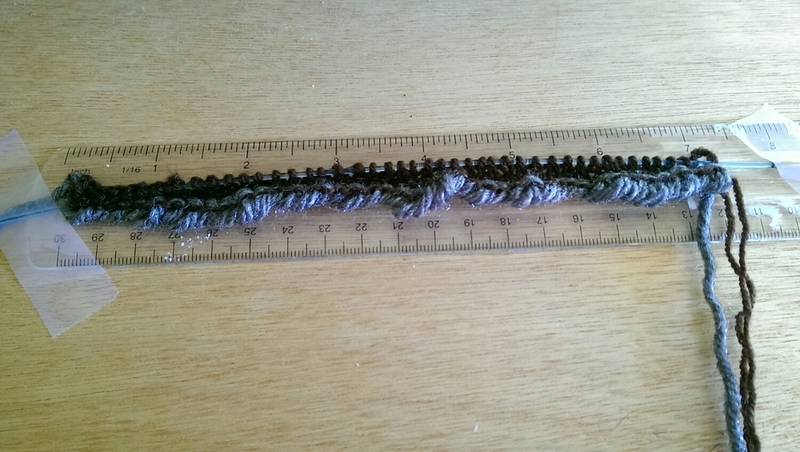 Adding these cables has shrunk the fabric from seven inches down to four inches. We have lost three inches of fabric! This is pretty dramatic just in a doll scaled knit. When I knit the adult medium, the impact of the cables was even more so. After the first four row pattern repeat. Several cables have been added, shrinking the fabric dramatically.